This festival brings together cultural partners and visiting authors for a weekend of book-based fun in Sister Cities Park! Enjoy story readings by special guest readers and local authors, along with music, make-and-take crafts, face painting and balloon art. Kids can also meet Dr. Seuss' The Cat in the Hat, the Phillie Phanatic, a K-9 unit, and tour a real-life Philadelphia fire truck! 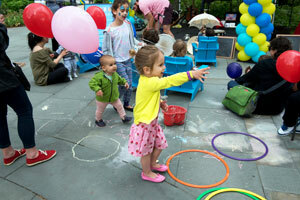 The Free Library of Philadelphia will be on-site with the Book Bike and library card sign-ups. You're also encouraged to bring gently used books to add to the Library in the Park Book Cart presented by TD Bank. Throughout the weekend, grab lunch or snacks at the Logan Square Café. Partners include WHYY and The Free Library of Philadelphia. Click here for a complete schedule and details. 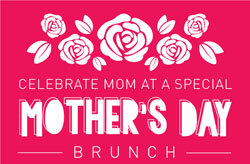 Bring the family to Logan Square Café for a special Mother's Day Brunch, May 12 and 13, at 10am! Celebrate mom with a VIP meet-and-greet with your favorite super hero mom. $10.95 for children 12 and under, $18.95 for adults, free for kids one and under. (Children one year and under must have a ticket if they require a seat.) Reservations required, please click here. It's spring and Center City has come alive as temperatures rise and pedestrians rediscover its vibrant, walkable downtown neighborhoods. From pop-up shops and outdoor festivals, to local and national designer trunk shows and seasonally-themed shopping events, the contemporary retailers and independent boutiques found only in downtown Philadelphia have something to offer for shoppers of all ages. Come to Center City and shop these deals to look your spring best. If it's in, it's in Center City! See what's in store for you! Looking for a way to support the Rail Park while enjoying a drink? The Trestle Inn has you covered! Stop in and order a Rye’d The Rails Cocktail with Jack Daniel’s Tennessee Rye – $1 from every cocktail is donated to benefit the Rail Park. It's $8 during happy hour (5-8pm) and $11 after 8pm. Take Mom Out for Something Nice, Why Don't You? Sofitel Philadelphia invites you to treat the special women in your life to a gorgeous feast this Mother's Day, May 13. From the raw bar to appetizers, to entrees and a carving station, to a sumptuous selection of desserts, it's all lovingly handcrafted by Executive Chef Edward Hancock (view the complete menu). The Mother's Day Brunch at Chez Colette will be available Noon-4pm, at $65 per person (half-price for children under 12), subject to all applicable taxes and 18% gratuity. For reservations, call 215.569.8300 or visit OpenTable.com. On May 20, 1-5pm, enjoy a delightful, self-guided walking tour of private homes and gardens in historic Society Hill. View architectural and interior styles ranging from the 18th-19th Century to contemporary. There's a new selection of houses each year. Come and get decorating ideas for your home! All open house tour ticket holders may also enjoy a 15% discount for dinner after the tour at five area restaurants. Advance ticket purchase is suggested. Tickets: $35 per ticket in advance; $40, at the door. Group rates for five or more available. Call 215.629.1288, or email mattdejulio@aol.com. All proceeds benefit Society Hill Civic Association.